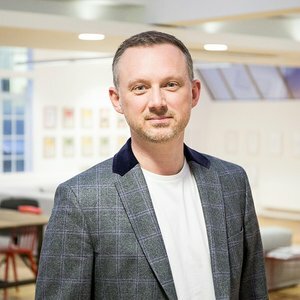 Nick Turner is responsible for driving the highest creative standards and output while attracting, inspiring and retaining exceptional talent at SapientRazorfish across EMEA. Prior to this Nick spent 16 years at AKQA, joining as an art director in 1998 and progressing to Executive Creative Director in 2011. He was instrumental in helping AKQA become the world’s largest and most awarded agency in its field. His extensive client list included Audi, Aviva, Barclays, BMW, Canon, Etihad, Fiat, Ferrari, Microsoft, Nissan, Orange, Philips, Sainsbury’s, TUI, Unilever and Virgin Money. A natural leader, Nick inspires and mentors a multi-disciplined team across SapientRazorfish EMEA offices. He applies his expertise, passion, and obsession with meticulous craftsmanship to produce intuitive, engaging and meaningful digital experiences for the world’s top brands. Nick is also on the Executive Board of BIMA (British Interactive Media Association).